Early February is not often thought to be the best time to golf, and yet, perhaps that made the chance to putt putt along the sunny skywalks between classic buildings and over snowy streets all the more enticing. 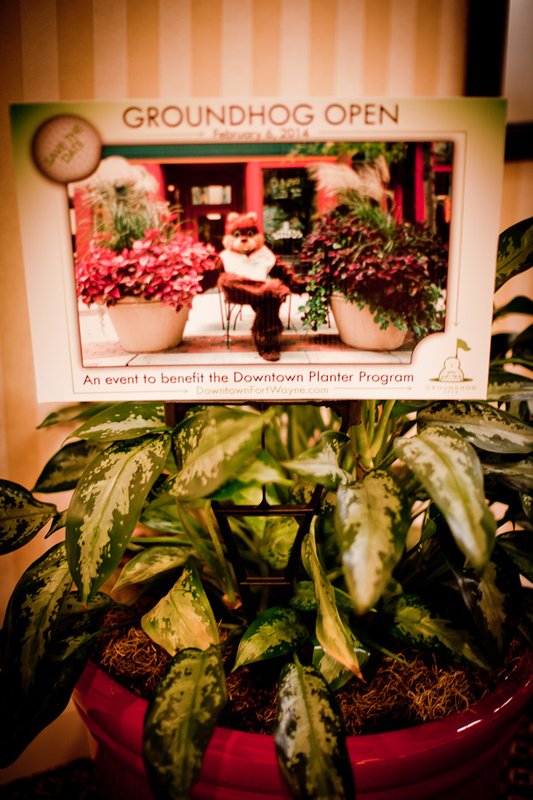 The Downtown Planter Program brightens spring and summer street corners throughout Fort Wayne, and the Groundhog Open was held as a benefit to raise funds for the expansion and maintenance of the planters. 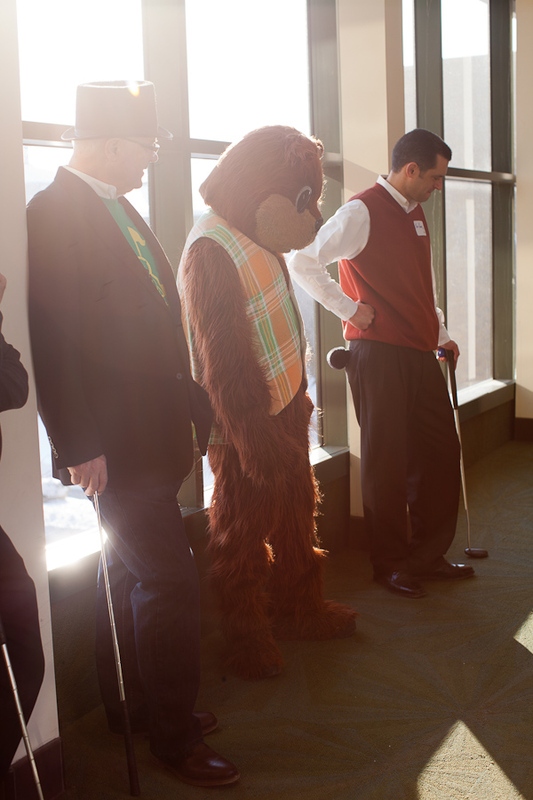 "Today is the third annual Groundhog Open in downtown Fort Wayne, a putt putt course set up ... all about adaptive reuse, the greenway runs through the Hilton Hotel, the Grand Wayne Convention Center, the Embassy Theatre/Indiana Hotel and the Courtyard Marriott and helps to support the Planter Program of Downtown Fort Wayne. We do this in conjunction with the Parks and Recreation Department; the proceeds add to the count of planters and also enhances the appearance of the planters. They were gorgeous last year." 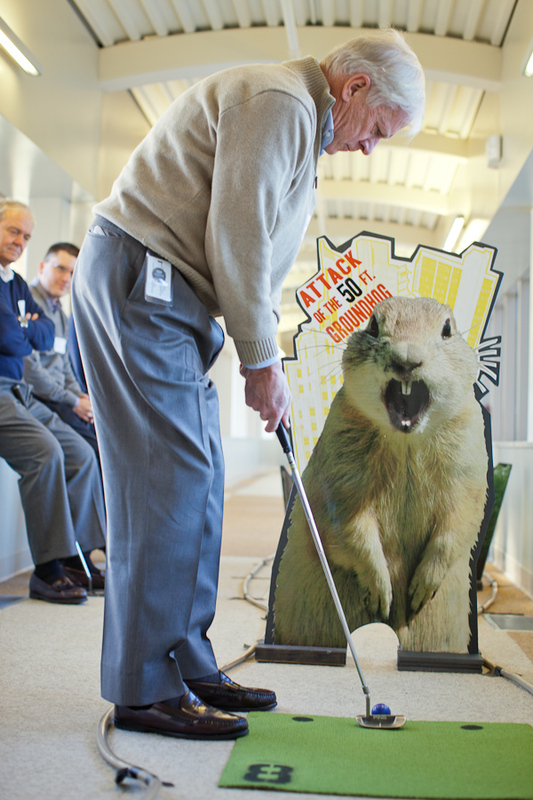 The Groundhog Open is an attempt to bring a little warmth to the middle of one of the coldest winters on record. 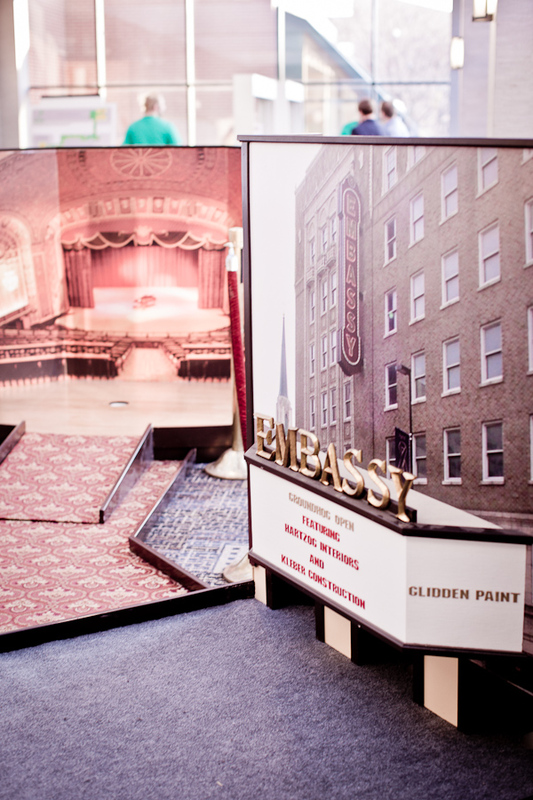 "It reminds people of the summer days and the beautification of downtown Fort Wayne. 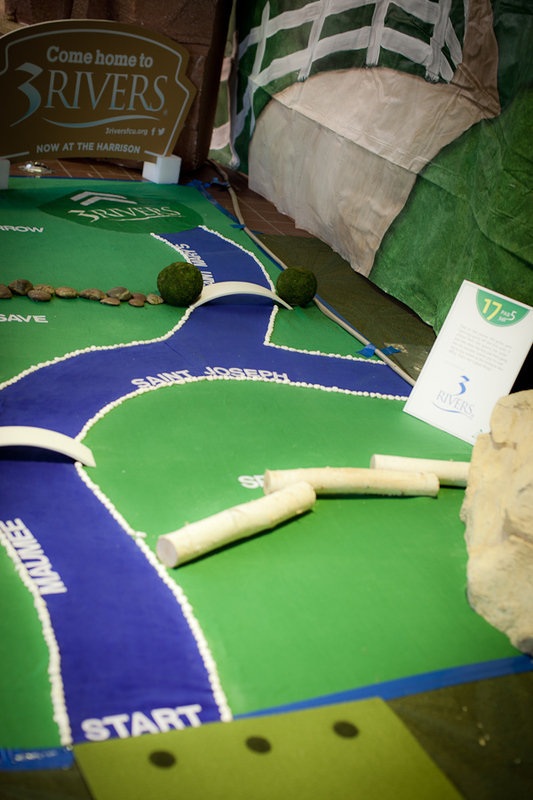 These facilities, with adaptive reuse of them, lay out well for the putt putt course and is a way for hole sponsors to get recognition for sponsoring various holes." This year the DID estimates the total raised will surpass $40,000 for the planter project. The Groundhog Open provides a nice opportunity for a lot of the hole sponsors to come out and help further awareness of the planter program. The next five years for Downtown Fort Wayne are going to be "pretty awesome," according to the president. "We will continue to work towards a better, more beautiful, clean downtown Fort Wayne can be proud of." Deputy Mayor Karl Bandemer, creator of the event spoke to us about his inspiration. "There are a number of businesses that do this sort of event in their offices. So we stole that idea and kind of blew it up and decided to do it downtown. We have a unique facility here that allows us to do this, and gives downtown Fort Wayne a reputation for creative reuse." His favorite hole was the one he sunk a hole in one, but he was unsure of exactly which. All for a good cause, the Groundhog Open is an event that gets a lot of contribution and business participation, as well as a lot of participation by the community at large. With an opening breakfast, a light lunch, and an awards and event celebration with prizes and hors d'oeuvres, it's an all day extravaganza focused on celebrating and making good use of historic and new infrastructure in downtown Fort Wayne. New this year was the addition of a presentation by Duke Butler, Tournament Director, about the Hotel Fitness Championship, which is poised to be another exciting event in 2014. For more information visit the Downtown Improvement District website. Want more of the Mayor and the Groundhog?